2) Defective items should be found within guarantee period. Extra Information: 1) Size and color: different color and fabric are available. special sample order depends on different models. Our product is large, so if you need two, three or many items pack into one container, we also can accept it. 3. Custom packaging service No matter the inner packing or the outer carton We can design as your request. 4. Where is your factory located9 How can I visit there9 A: Our factory is located in Ninghai, Ningbo and near Ningbo airport. 4.Top pole cross base and polyester steel pole for strength and durability. 5.The perfect choice for your home or business outdoor entertaining areas. 4. Factory visit service Sincerely welcome to visit us anytime. 1. When can I get the price9 We usually quote within 24 hours after we get your inquiry. 5.How many colors are available9 We match colors with Pantone Matching System. So you can just tell us the pantone color code you need. 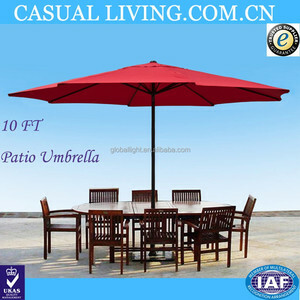 We can offer all kinds of umbrella as your need. if you want to know more about our company or interested in our company,pls directly contact us on line or by mail,we will reply you soon. GUARANTEE: 1) High quality with competitive price 2)OEM and DEM is welcome 3)quick reply and best service. 9ft Aluminum Outdoor Patio Umbrella Market Yard Beach w/ Crank Color options: Khaki Materials: Polyester Canopy and Aluminum Rib and Pole Shade Size: 9&rsquo;ft Dimensions:&Phi;102.3&rdquo;&times; 94.4&rdquo;H Pole diameter: 1.5&rdquo; Overall Height: 94&rdquo; Weight: 6.6 lbs Pole Material: Aluminum Weather resistant Easy assembly. 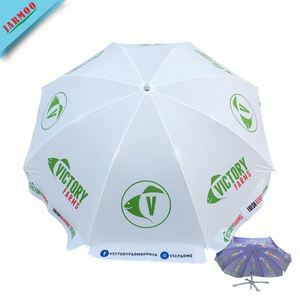 Package Includes:1x Aluminum Patio Umbrella NOTE: Stand is not included MORE PHOTOS Tips: More information please contact ALEX_LOU by the E_mail attached down the web page or you can chat me directly through the TRADE MANAGER . 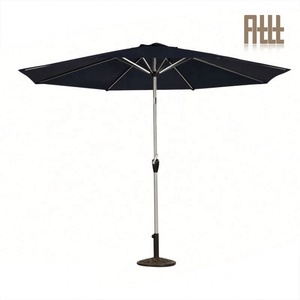 Parasol Umbrella Covers Cantilever Parasol Protective Outdoor Umbrella Covers Product Features: Best quality Polyester fabric, waterproof & UV tested, draw-cord for tightening. A comprehensive range of waterproof garden banana parasol covers to fit 3m to 3.5m cantilever parasol; it can be left outside all year round. Our all weather parasol cover is designed to withstand extremes in temperature, frost, snow, rain and UV. 1 YRS Taizhou Cenzo Outdoor Products Co., Ltd.
2 YRS Quanzhou H&Shine Outdoor Living Technology Co., Ltd.
Aluminum The most durable and versatile of the pole material options, aluminum is rust-resistant and extremely strong. Many aluminum umbrellas have a tilt feature and aluminum is usually offered in a wide range of finishes. 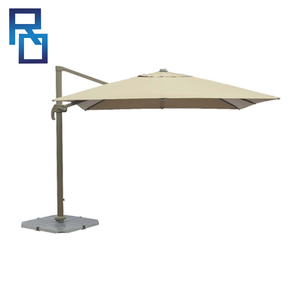 Steel Steel umbrellas offer many of the strength and feature benefits of aluminum but it's less expensive. Fashion cheap umbrellas for yard It is the perfect solution for big terraces with several umbrellas on the wall or for a small terrace with only one umbrella. 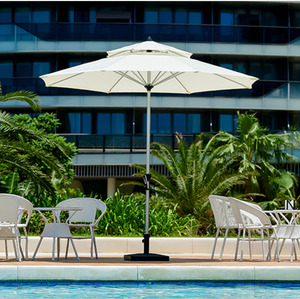 The shade can be set based on the position of the sun while the entire surface below the parasol remains free. You can take the umbrella out of the clamp and close it or connect the umbrella on the arm through the zipper in the umbrella cloth. 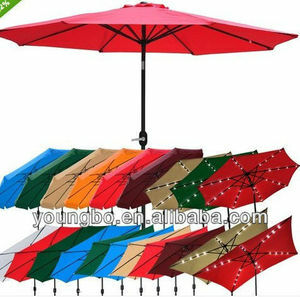 Alibaba.com offers 14,886 yard umbrella products. About 2% of these are patio umbrellas & bases, 1% are umbrellas. A wide variety of yard umbrella options are available to you, such as aluminum, wood, and stainless steel. 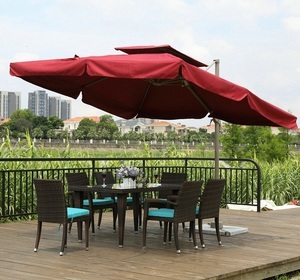 You can also choose from umbrella, base. As well as from free samples, paid samples. There are 14,886 yard umbrella suppliers, mainly located in Asia. 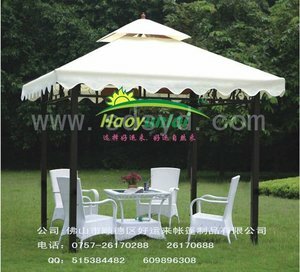 The top supplying country is China (Mainland), which supply 100% of yard umbrella respectively. 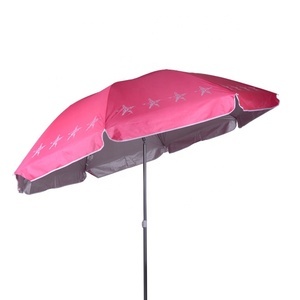 Yard umbrella products are most popular in North America, Eastern Europe, and South America. You can ensure product safety by selecting from certified suppliers, including 3,350 with Other, 109 with ISO9001, and 22 with ISO14001 certification.